Minister Ramsammy in discussion with Canadian High Commissioner to Guyana and Canadian farmers’. [www.inewsguyana.com] – Guyana’ dairy, small ruminant industries are to receive a major boost through technical, and others assistance from Canadian farmers. This is being realized through a Government to Government collaboration facilitated by the Inter-American Institute for Cooperation on Agriculture (IICA). 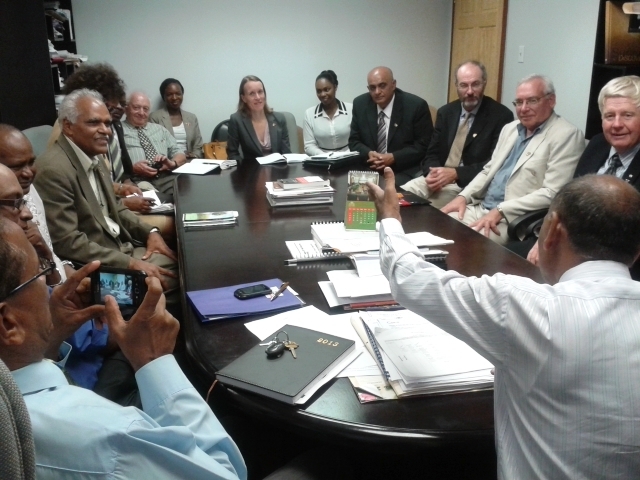 At a meeting in the boardroom of the Ministry of Agriculture, Canadian High Commissioner to Guyana Dr. Nicole Giles and a delegation of Canadian farmers’met with Agriculture Minister Dr. Leslie Ramsammy. The meeting saw the areas of cooperation drafted which will shape and form the initial cooperation among the two countries. Among the areas discussed was the establishment of a State-of-the-Art Dairy Processing Plant which is expected to become operational within one year’s time. Dr. Giles expressed her delight at the outcome of the meeting between the Guyana Government and its Canadian counterpart, describing it as a productive one. “The commitment that we have certainly made is to have a plan; to do so within one year but we all agree that we don’t want perfection to be the enemy of progress and that we will work together on a step by step basis to come up with a comprehensive approach from data management to production, to quality to market,” she said. With respect to high quality system, enhanced technology, Ambassador Giles stated that this is one such area of which the Canadian Agricultural Industry has a lot to offer in. Shortly, a team will be established which comprises of the various sectors according to the Ambassador, of which will be working to have the plan fully developed. Meanwhile, Minister Ramsammy welcomed the move, which will significantly boost the sector. He added that the establishment of a Dairy Industry in Guyana is crucial and something which will be well received by society at large, especially farmers. “We (Guyana Government), are very happy to be collaborating with Canadian Farmer….Canadian Farmers have ensured that Canadians are not only well fed but Canada is one of the World’s leading exporter Guyana can benefit enormously from Canada,” he said. Lloyd Wicks, an Ontario farmer who headed the delegation on their first meeting with Minister Ramsammy pointed out that the collaboration will pave the way for Canada to introduce some of the mechanisms presently being used to Guyanese farmers.